1. Place the chopped mango and pineapple juice in a blender container or food processor bowl. Cover and blend or process until smooth. Cover and refrigerate the pureed mixture. 2. Meanwhile, in a large glass bowl, pour boiling water over the tea bags and mint sprigs. Cover and let steep 5 minutes. Remove and discard the tea bags and mint sprigs. Cool, covered, for 1 hour. Chill for 2 hours. 3. 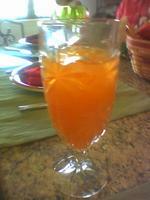 Transfer the chilled tea to a 2-quart pitcher; add the pureed mango mixture and sugar. Stir until the sugar is dissolved. 4. To serve, pour the tea mixture into ice-filled glasses. Garnish each glass with an additional mango slice and a pineapple star. Makes 6 (8-ounce) servings.